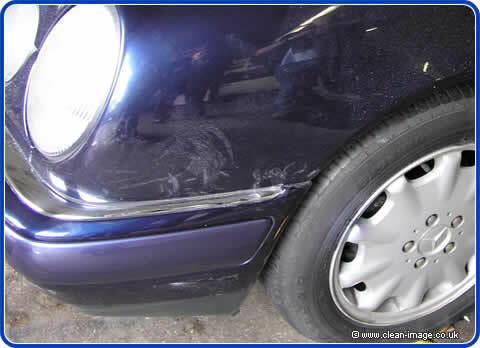 Your Dad asked me (twisted my arm) to finish the article on his car so you could have a look at the photos to see how it turned out. So here they are - especially for you. For everybody else who reads this, Paul saw the article on our Porsche restoration while working in Japan and thought he might like his own Porsche done too when he gets back to Blighty, and so he sent his Dad down here with the Mercedes as a guinea-pig! We hope that Paul does bring his Porsche to us - for no other reason than we can say that our services are so good that people travel all the way from Japan to see us! ...or is that stretching things a bit? Probably. After a quick wash over so that we could see what we were doing, the first job was to deal with the scuff on the bumper (shown above) Jeff has already applied the masking tape. 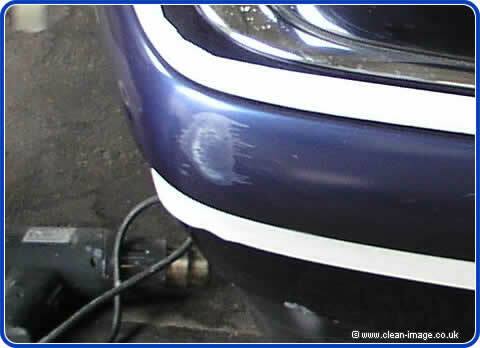 Luckily Jeff already had the right colour of paint mixed up for this bumper and so he was in-and-out like the S.A.S., leaving us to get on with the next stage. In case you are wondering - the rumble strips on this model of Mercedes are supposed to be a different colour, and it was a good colour match. 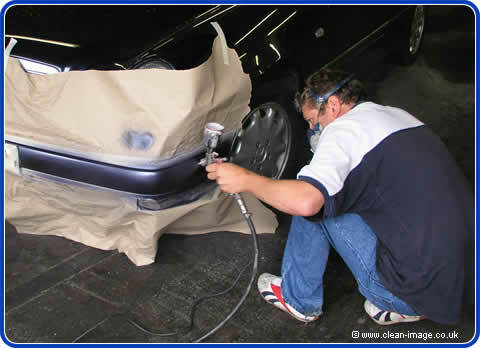 As you can see from the above photo, after the masking was removed there was some light over spray and dust from the sanding so the car was given another quick wash and then the whole car was cleaned with a clay bar.